Las Vegas' downtown has arrived. No, it wasn't the Life Is Beautiful festival this weekend. As many of you know, when I'm riding at night, I try to make myself very visible. My bicycle has 2 headlights, 3 tail-lights, extra reflectors, and reflective tape. 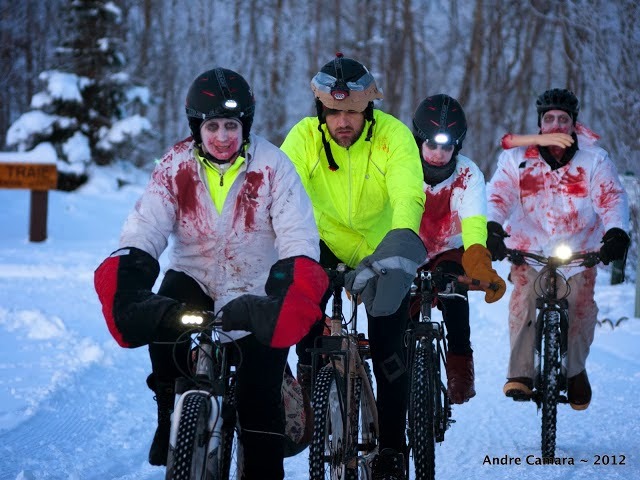 I also have a bright headlight on my helmet and wear a reflective vest and wristbands. I'm such a conspicuous sight, people often yell out comments when they see me. Just a few nights ago, I turned onto a quiet street. Two teenaged boys were walking toward me along the opposite side. As I got closer, the boy in front called out, "Hey! You need all them lights?" Before I could answer, the 2nd boy yelled at him, "So nobody won't hit him, fool! What d'ya think!" That really made me laugh. It was nearly as funny as the night a man standing in his front yard stared at me as I rode up his street, then turned toward his house and yelled, "Hey! Come look at this [vulgar expletive deleted]! He's all lit up!" 4. "If people can't see that getup, they must be blind!" 5. "Oh! He's got a flashlight on his head!" 7. "Excellent job with the lights! Excellent job!" 10. "Got enough lights on that thing?" 11. "I see you coming!" 12. "People can see you coming a mile away!" 13. "That's the way to be lit up! You know how to not get hit!" 14. "I'm so glad you've got all those lights, or I might not have seen you!" This is the cutest example: One night I turned onto a quiet street and saw two little girls (maybe 7-9 years old) standing next to it about 100 yards away. They stared at me, and one of them, who looked a little older, said to the other one, "What is that? What is that?" When I was about 100 feet from them, they started to step into the street. Worried they might walk in front of me, I hit my brakes and stopped next to them. They looked like sisters, and after staring at my bike for a moment, the older one said to me in a hushed tone, "What is that?" "You mean my bike?" I replied in surprise. "Why is it all lit up?" she asked. "Oh," I replied, "that's so car drivers will see me and not run me over." 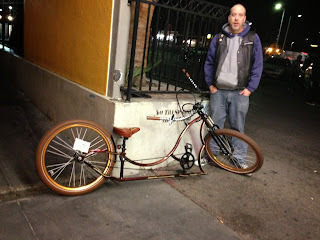 I said goodbye, and as I started to pedal away, I heard the same girl say, "What a cool bike!" That really made me smile. I wonder if they asked their parents for a lot of lights for their bikes. It's a lovely day to erect a bridge over Far Hills Avenue outside Vegas. Nothing like rolling a mountain bike out your front door, pedaling to less than a mile to a mountain trail and cranking into a side of red rocks. I took it to the "Little Red Rocks" and was amazed at my own little Life Is Beautiful. When you're a photographer covering the Life Is Beautiful festival in downtown Las Vegas, you need two main tools: a camera and a bicycle. The bicycle resources that are within easy access of my front door are amazing. I biked about six miles to an amazing single-track bike trail off Town Center Drive, south of the 215. Then while biking home, I pedaled a hard-dirt trail that is being built into a paved trail along the 215 from Charleston Ave. to Alexander. On my cross road, there's a new bridge span going up today. Let's look at all this. Heading home I took the pre-done trail along the 215 -- it's great for mt biking right now before they pave the thing. And the bridge span over Far Hills Ave is going up today. This morning I met Dr. Scott, a semi-retired veterinarian and vet teacher at Nevada State College in Henderson. We pulled up together on our road bicycles at the Red Rock Canyon scenic loop toll booth and went on to chat and bike the entire 13 miles together and the six miles back to the Summerlin shopping area at Charleston/Desert Foothills corner. 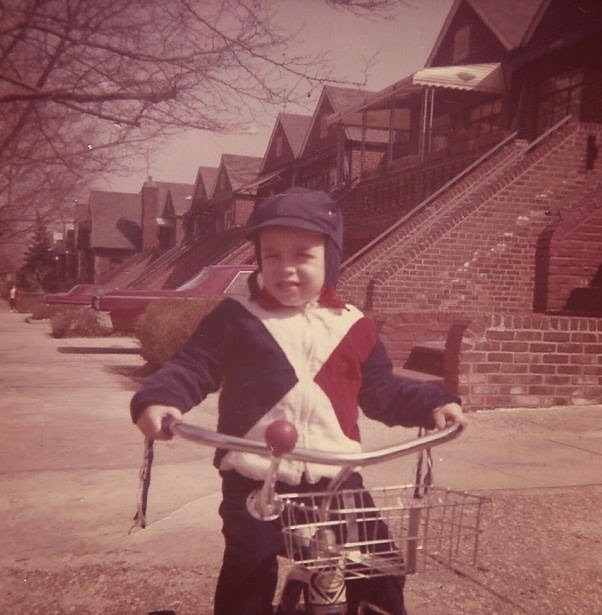 We're both in our 50s, from Brooklyn, went to Mets games in Queens and look at bicycling as an amazing meditative endeavor besides offering the obvious physical health benefits. This morning was Scott's 700th trip around the Red Rock loop -- a startling feat. He loves to bike south Utah, too. 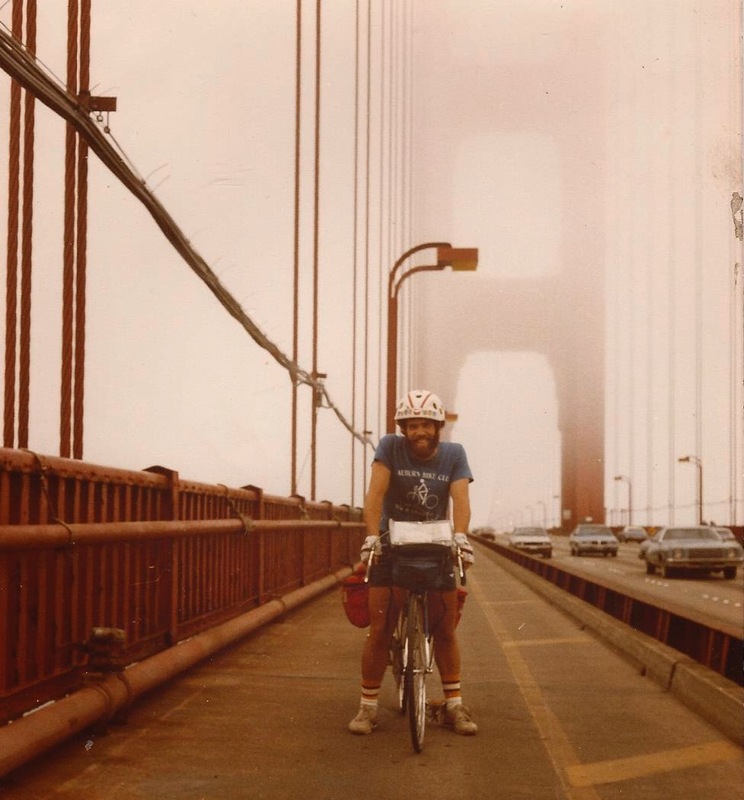 He was a vet in Italy for nine years and loved cycling Europe, He traveled to Asia and Africa, too. He has lived in the Vegas area for the last decade. "You're not promised tomorrow. I love biking. I live for the here and now." Good advice from someone who has been around the Red Rock loop a few times. This is practically my back yard. Just hop on a GT Zaskar LE, start pedaling up the dirt hill and you can see amazing red rock formations upclose that seem so for away when you're in a car in the neighborhood. 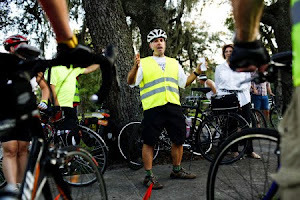 Our friends in Georgia successfully stopped an anti-bicycling bill, HB 689, in the state legislature earlier this month. 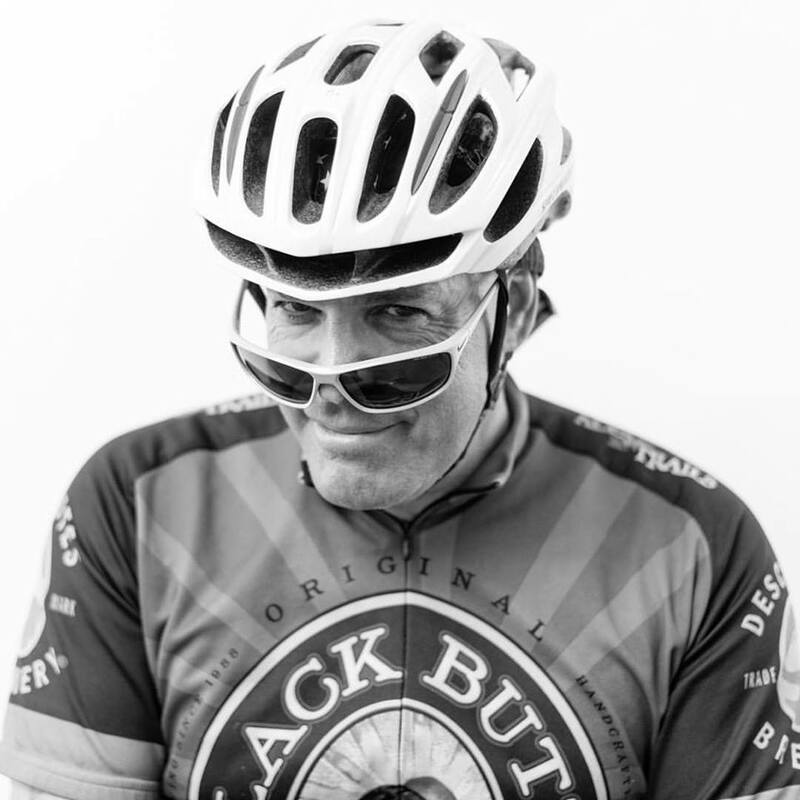 The law would have required tags and registration for bicycles, remove the right to ride two abreast in the road, place strange requirements on group rides and make some unrestricted public roadways "off limits" to bicyclists. 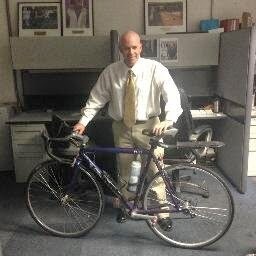 Georgia Bikes, along with other advocates, lead the charge in getting the bill pulled from consideration. Read Georgia Bikes guest post here, and read about the victory here. Greg LeMond drops the hammer on Lance Armstrong during an Anderson Cooper interview on CNN. The bike ride on the Red Rock Canyon Scenic Loop began with this. If mountain bike commercials were done like car commercials. All you need is pretty scenery, a phony deep voice, a dumb punchline and the brand name at the end. One day several years ago in Clearwater, I was bicycling on the Clearwater East-West paved trail that skirts the edge of the Phillies' spring training complex, including running right behind the centerfield fence of one of the training fields. I stopped at the chainlink fence and began chatting with a young centerfielder by the name of Shane Victorino. We chatted about the Mets-Phillies games and I was always impressed that this major-leaguer was so down to earth and friendly and willing to chat up a passing bicyclist. That's what I recalled last night when Victorino hit the grand slam for his new team, the Red Sox, and helped them get into the World Series. And it was another reason why I appreciate bicycling so much. Cool to see a woman in Summerlin who uses a bicycle for practical transportation purposes. 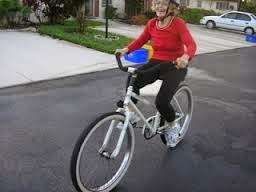 She rides it to the tennis center in Summerlin and parks it inside the fence. 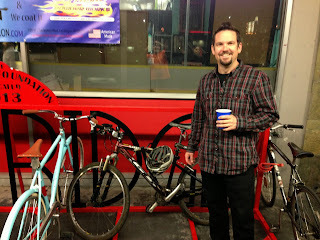 On a gorgeous unsually cool night in Las Vegas, I biked a mountain bike converted into an urban chariot -- a GT Zaskar -- to ride to the Faciliteq building, which is on Main Street in Las Vegas in a tough neighborhood and no man's land between the redeveloping downtown and the evolving hip arts district. On First Friday, Faciliteq's owner, Quentin Abramo, has a happy hour for his dozen green, environmentally-minded business tenants. I did a story on Quentin marking eight years in the building this month. After chatting with some of the commercial tenants, I biked about a half-mile to Amie Pellegrini's unqiue boutique bike shop called Town Bike. Amie mentioned there was a celebration to mark the debut of an amazing, giant bicycle rack near the Huntridge Theater, a historic theater getting a rehab on busy Charleston Blvd. 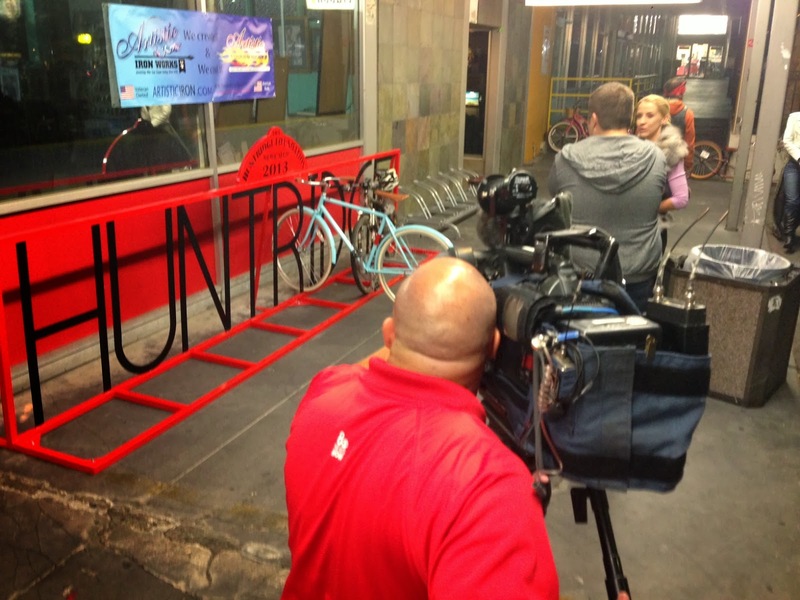 A company known for its great iron work jobs -- Artistic Iron Works -- crafted the new bicycle rack. 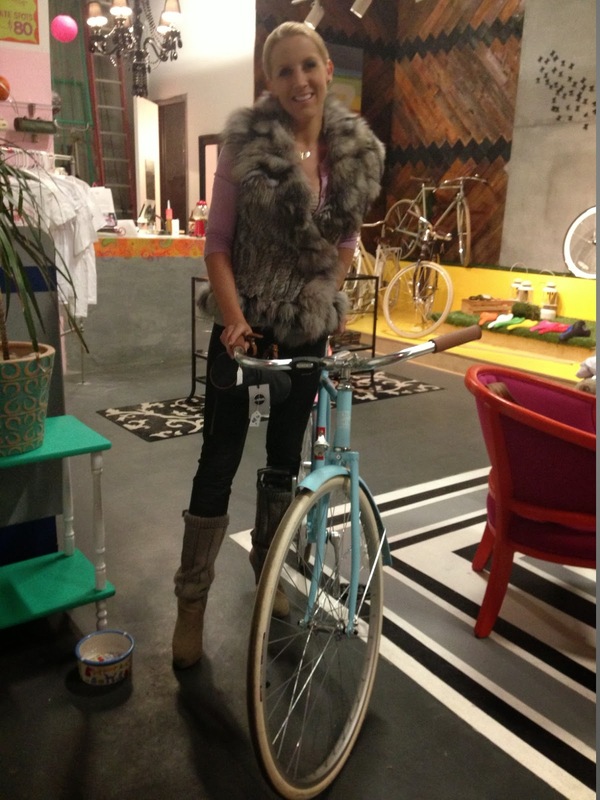 Here's Amie in her bike shop getting ready to bike to the bike rack event. 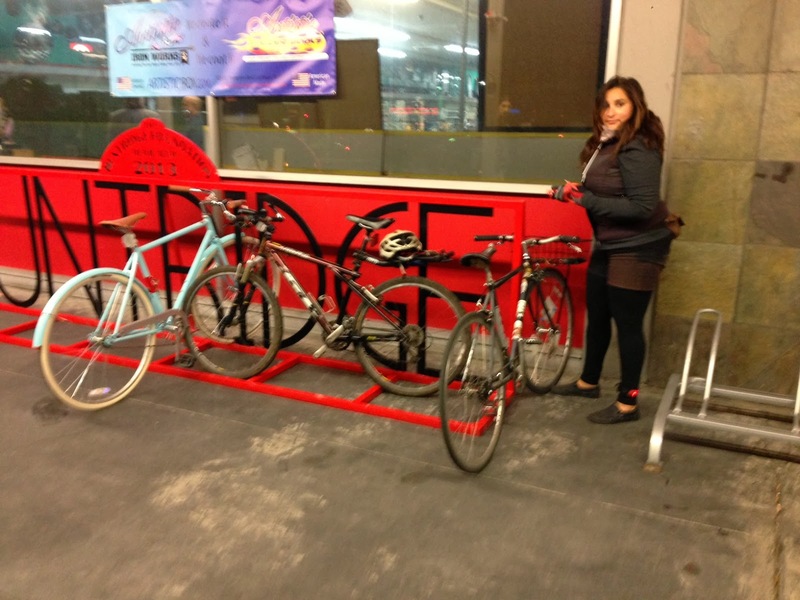 Then it off to see this amazing bicycle rack. 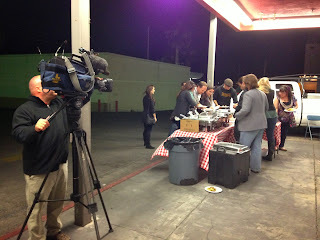 Channel 8 was there and the local neighborhood was celebrating with cool Mexican eats. 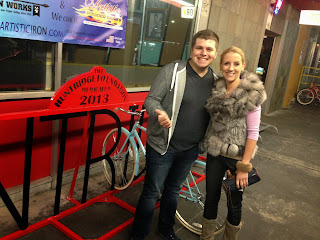 The giant bicycle rack was amazing. A guy named Lance saw my GT Zaskar and said he did the same thing that I did -- convert the 1990s-era mountain bike into an urban bike complete with tire slicks and rear carrying rack. The bar near the Huntridge Theater is a hangout for bicyclists on low riders and coasters. Like this guy.